5050 Solderless Connectors is a wireless solution for connecting two separate lengths of LED Tape. To be used in conjunction with either Single Colour 5050 LED Tape ( two connectors) or 5050 RGB LED Tape (4 connectors). 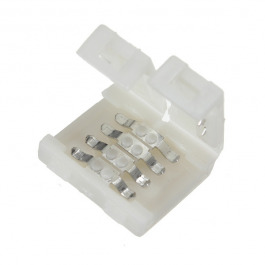 You will NOT have to use any soldering materials in order to use this connector. For more information on this product please contact us on 0116 321 4121 or email support@ledstriplights.co.uk. *LED Tape in picture is not included and is sold separately.